As part of our on-going partnership with Parks Victoria, DEPI and Dr. Dan Harley “Project Possum” aimed to provide an additional 200 nest boxes for Leadbeater’s Possum in the wild to supplement their declining forest habitat. We offered an opportunity for our supporters to contribute to this program by “adopting” a nest box. The adoption of a nest box allowed one to be custom made, installed by our field volunteers and monitored annually to assess use by LBP colonies. 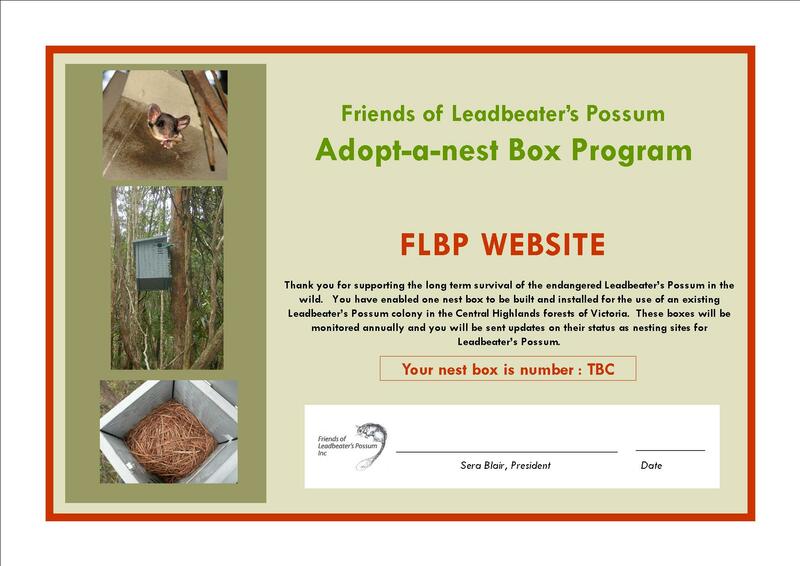 As of May 2013 Friends of Leadbeater’s Possum (FLBP) With the help of Parks Victoria have assisted with the adoption of 200 Leadbeater’s Possum (LBP) nest boxes with 102 installed in LBP habitat and regularly monitored. Further assistance for installation and monitoring from 2013 – 2015 is provided through DEPI’s Communities for Nature Grant funding. The nest box installation program will consist of 100 locations with 2 adopted nest boxes to be located at each of these sites. LBP colonies will use up to 3 or more nesting locations within their habitat range which they readily move between. The adopted nest box project aims to fill 2 of these nesting locations for each colony. 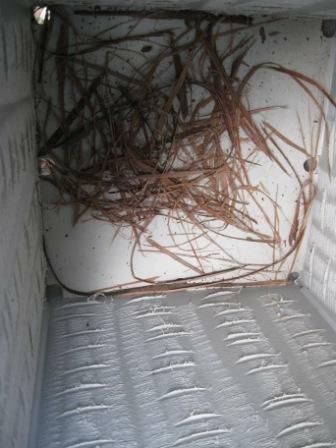 Presence of nesting material in nestbox. Evidence of LBP. The projects intention is to initially locate 100 nest boxes, adopted boxes 1 to 100, in the habitat / territory of a LBP colony. This may be a matter of trial and error, moving boxes around in areas of known LBP habitat until we successfully identify use by LBP’s. Once the nest boxes show evidence of LBP presence then an additional nest box will be placed in a suitable location within this LBP colonies territory. Hence the adopted nest boxes 101 to 200 will be used to round out the second nest boxes in each colonies territory. The future of the “Adopt a Nest Box” project is to continue to raise funds through grants and donations to ensure that a Project Possum Co-ordinator can be contracted to continue to ensure project longetivity. FLBP currently have nest box adoptions on hold whilst the initial 200 adopted nest boxes are installed, monitored and moved as necessary to ensure that they house a LBP or colony. As “Project Possum” is dealing with wild populations of LBP’s we cannot define how long this process will take. It is likely to be at minimum a couple of years of trial and error until we can ensure the original 200 adopted LBP nest boxes are in the most viable locations and most importantly being used by LBP’s. Nest boxes located in the Sup-alpine Woodland tend to have a high uptake by LBP’s. The nest boxes located in Montane Ash Forest many of which have been funded through the Adopt a Nest Boxes appeal have had a more limited uptake. 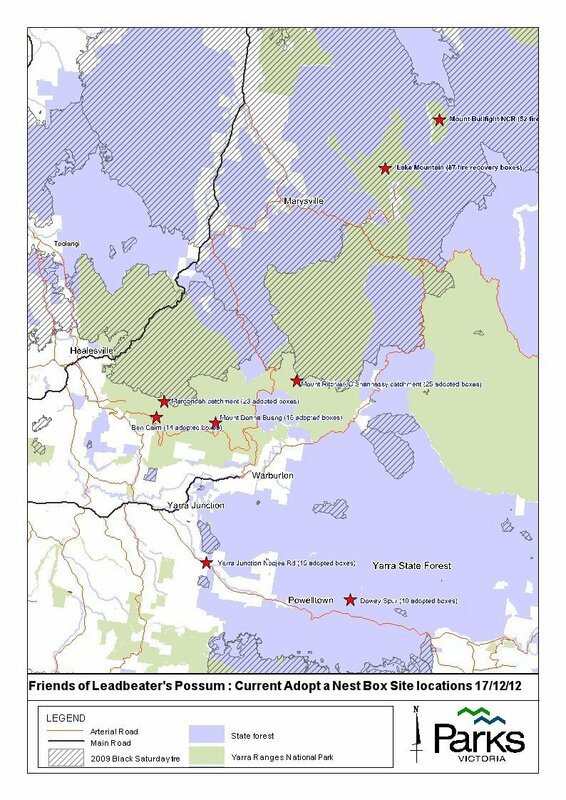 Much work has now been undertaken on refining our site selection to increase LBP uptake in Montane Ash Forests. This includes detailed habitat surveys and ranking of key habitat features at selected sites to ensure the greatest chance of uptake. Any boxes that haven’t shown LBP presence during our monitoring will be re-assessed, with our new knowledge relating to site ranking and may be moved to a new location with a higher site ranking. There are currently still 22 LBP nest boxes that require moving. LBP’s are quite fussy about their habitat requirements! The long term concept of “Project Possum” is to promote the adoption of 300 nest boxes. It is proposed adoption of nest boxes will remain on hold once 200 nest boxes have been adopted. This will enable us time to get all 200 nest boxes installed and a monitoring program underway. FLBP will continue to take details of interested adoptees for the further 100 nest boxes. FLBP will contact the relevant interested adoptees once the project resumes to finalise the adoption process. Nest box owners can participate with fieldwork and observe their box with current membership. Map is currently being updated new June 2014 map coming soon. As a result of the Black Saturday bushfires in February 2009 around 43-45% of the population was decimated.